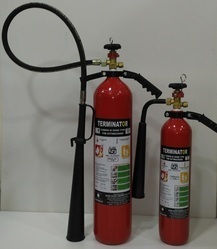 Leading Manufacturer of co2 fire extinguisher 2 kg, carbon di-oxide fire extinguishers, co2 fire extinguisher 4.5 kg, co2 fire extinguisher and carbon dioxide extinguisher from Chennai. We have gained wide recognizance as prominent entity offering next generation Co2 Fire Extinguisher 2 Kg. The offered model is suitable for B Fire class and fitted with highly reliable components that offered optimum protection from fire caused due to electric ignition. Our experts have designed an easy grip control valve to provide optimum protection in case of fire emergency. The easy to use fire extinguisher is developed using premium grade raw materials and feature assurance of ISI mark. 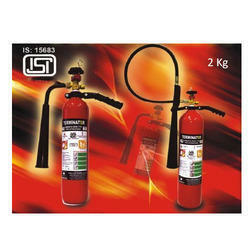 Further, we are providing the high performing fire extinguisher at a leading price. 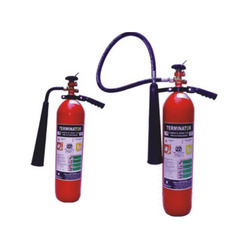 We have complete allegiance in developing highly demanded Carbon Di-Oxide Fire Extinguishers. We are leveraging the sophisticated manufacturing techniques to present the most reliable model of fire extinguisher that offers optimum protection against fire caused due to combustible solids, inflammable liquids, gases and electrical fire. The offered model features 8B /13B fire ratings and developed with the quick and efficient flame knockdown property of Co2 gas. Further, we are providing the quality compliant fire extinguisher in 2 / 4. 5 KGB capacity at a competitive price. We have firm allegiance in developing finest grade Co2 Fire Extinguisher 4.5 Kg. Our offered fire extinguisher is wining strong trust of our clients from both industrial and commercial sites as the offered model is specially designed for light and ordinary hazard protection. We have invested in next generation manufacturing techniques to present the highly efficient model which is suitable for instant use. The offered model is designed for simple operation and convenient maintenance and rigorously tested by our experts for its efficiency. Further, we are providing the quality approved fire extinguisher with powder coating at a leading price. Our technological adeptness has made us the pioneers of high quality Co2 Fire Extinguisher. We take pride in presenting the highly reliable and highly efficient fire protection equipment that is best suited for fighting against fire caused by flammable liquids, gases, live & delicate, machinery, electrical & sophisticated electronic equipment transformer & switch gear. Our experts are sourcing best suited inventory of raw material to develop the ISI marked fire extinguisher that comes with powder coated surface for option corrosion resistance. Suitable for -10° C to +55°C temperature these fire extinguishers are accessible from us at the best price. 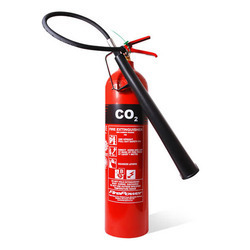 We have firm allegiance in developing high quality Carbon Dioxide Extinguisher. The offered model works with carbon dioxide gas as the extinguishing chemical which works best for fighting electrical fires. We have presented an industry compliant range of Co2 fire extinguishers that are widely utilized at offices, hospitals, chemical labs, schools & showrooms. We are utilizing the next generation manufacturing techniques to present seamless cylinders in these equipments. Further, the ISI marked fire extinguishers are accessible from us at a competitive price.